Cats vs. Dogs – Who Rules The Internet? They are very popular on the Internet, maybe even more on Social Media. Yes, cats and dogs have become real superstars online. Some even became huge celebrities on the web. I am sure you have heard of LIL BUB, Colonel Meow (R.I.P. ), Grumpy Cat (of course!) and the famous head-tilting pugs, Minnie and Max. But in the end, who are the most popular on the Internet: cats or dogs? Cats vs Dogs – Check out the answer you have been waiting for! Who is more popular on the Internet? 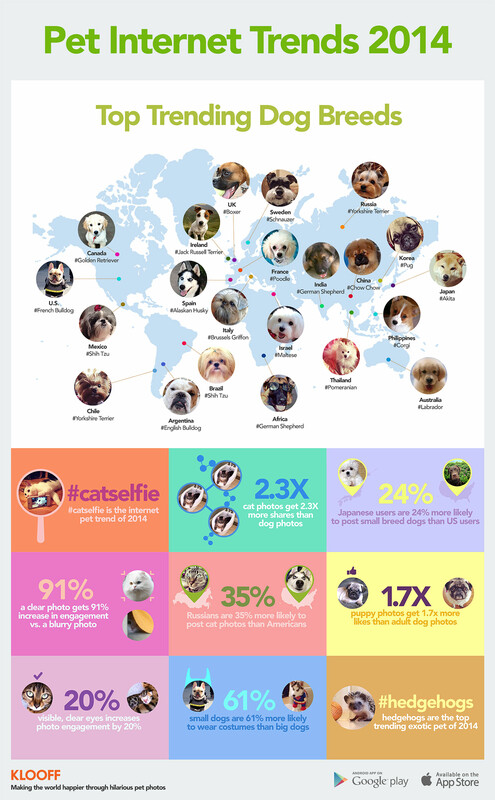 The fun guys at Kloof, a pet photo-sharing platform, designed a great infographic to answer this question. And despite being such lovely companions in real life, dogs are not the most popular online. The truth is here: cats rule over the Internet. The truth is here: #cats rule over the Internet. There is no doubt about it. In fact, pictures of cats receive more than twice more “likes” than pics of dogs. But I am pretty sure the #catselfie trend is no stranger to this success. What’s your favorite? Come on are you a dog or a cat person?